US President Donald Trump has received a new letter from North Korea Chairman Kim Jong Un, and discussions are currently underway about a second meeting between the two leaders, White House spokesperson Sarah Huckabee Sanders said Monday. 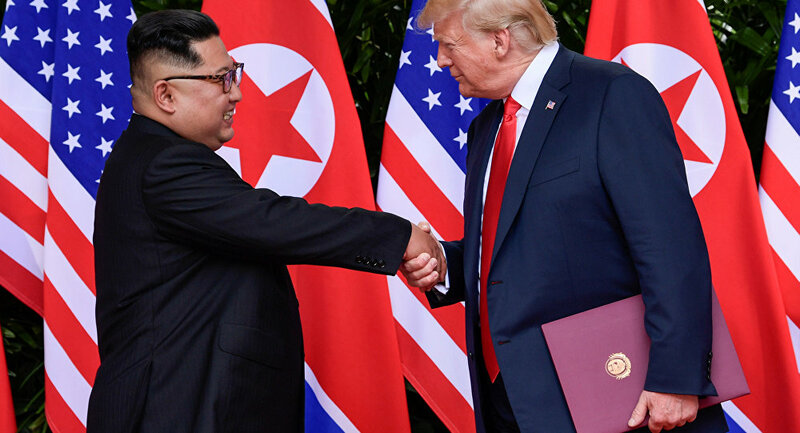 Author and professor Tim Beal, whose most recent book is "Crisis in Korea," joined Radio Sputnik's Loud & Clear Tuesday to discuss a potential second summit meeting between Trump and Kim. ​"There's Trump on the one hand and the establishment and the military on the other," Beal told hosts John Kiriakou and Brian Becker. "We have this seen this time and time again. So the big question is whether Trump can break through this and construct a deal with North Korea. Personally, I am skeptical about that, but we have to hope that he can." "Polls are dropping and so forth, and the only place where he [Trump] seems to be getting somewhere in his own mind is North Korea," Beal added. Although Trump canceled a visit to North Korea scheduled for the end of August by US Secretary of State Mike Pompeo, citing a lack of progress in nuclear negotiations, Sanders said Pyongyang is showing signs of good faith, such as its decision not to showcase nuclear-capable missiles in a military parade over the weekend. "The recent parade in North Korea for once was not about their nuclear arsenal. The president has achieved tremendous success with his policies so far, and this letter was further evidence of progress in this relationship," Sanders said, Sputnik reported. Yet on Tuesday, White House National Security Adviser John Bolton said that North Korea has not taken the steps required for denuclearization. "The US has lived up to the Singapore declaration," Bolton said in a Fox News interview Tuesday morning. "It's just North Korea that has not taken the steps that we feel are necessary to denuclearize." "We haven't got a clear separation between Trump and the deep state. Bolton is Bolton, but he is also part of the neocon establishment. He worked George W. Bush and so forth, even though Trump appointed him. Bolton is obviously very much against these talks with North Korea," Beal told Radio Sputnik.